The research done at CREA Mont-Blanc is driven by a desire to understand the functioning and evolution of alpine ecosystems, in particular in the context of a changing climate. An innovative hybrid, CREA Mont-Blanc combines the use of automated equipment, field work, citizen participation and sharing of knowledge and results — all with the scientific rigor of an academic laboratory. Simply existing in the mountains is a serious challenge. The plant and animal species living at high elevations must adapt to extreme seasonal changes: from long, harsh and snowy winters that only allow for short growing and reproduction seasons, to strong sun and drought in the summer. Climatic conditions that change quickly and vary widely based on elevation and slope aspect require species to be flexible and unconstrained to a small geographic area. As is the case more generally with biodiversity, our understanding of alpine ecosystems and their functioning remains limited. Nonetheless, understanding these ecosystems is key for anticipating the impact of current environmental changes, both in terms of biology and ecosystem services (water supply, recreation, protection against natural hazards, biological diversity, etc). In hope of contributing to a greater understanding of the functioning of mountain ecosystems as a whole, the researchers at CREA Mont-Blanc focus their work on high elevation flora and fauna. CREA Mont-Blanc’s method of research combines long-term monitoring of underlying environmental parameters with the study of issues related to particular species and populations with the goal of better understanding their functioning and adaptations. Far from the image of a scientist in a lab, CREA Mont-Blanc carries out its research and studies target species directly in their natural environment. Mountain ecosystems are constantly evolving. Anthropogenic pressures, whether it is climate change or land use, present these species, which are specially adapted to their climatic conditions, with a new set of disruptions. How do different species adapt to changes in temperature or snow cover? What is the impact on the scale of ecosystems? How will biodiversity in alpine areas change? These are just a few of the questions that CREA Mont-Blanc is trying to answer. 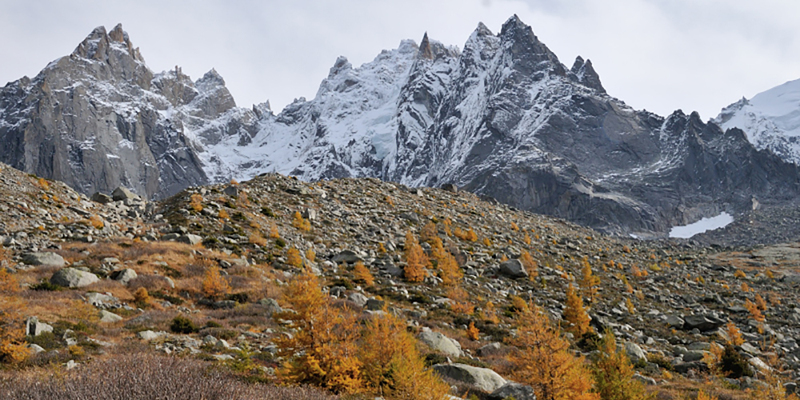 In its quest to improve our understanding of mountain environments, CREA Mont-Blanc takes a long-term approach to studying a variety of parameters: natural seasonal cycles (phenology), geographic distribution in terms of elevation, high elevation population dynamics (growth, reproduction, survival rates, etc), and animal behavior. The advent of accelerated climate change has inspired renewed interest in understanding these under-examined ecosystems. Increasingly, this kind of fundamental research is necessary in order to help develop strategies for communities living in and dependent on mountain ecosystems to adapt to climate change. Visit our research programs page to learn more. CREA Mont-Blanc applies international research standards to its work. Methods, analyses and results undergo peer review before publication or presentation in conferences. Collaboration is a key component of all scientific research and because of our emphasis on an interdisciplinary study, is a main tenant of CREA Mont-Blanc’s approach. We count, among our scientific partners, both internationally renowned researchers and institutions (CNRS, Swiss universities and Italian research teams) and managers of natural protected areas who contribute an applied research perspective. The most unique quality of CREA Mont-Blanc’s approach is its contact with the general public. CREA Mont-Blanc emphasizes sharing results and data (through its open data policy) and is a leader in France in participatory and citizen science initiatives. To learn more, consult our research strategy (in french), our publications,and our collaborations.